So, you want to originate consumer mortgages? 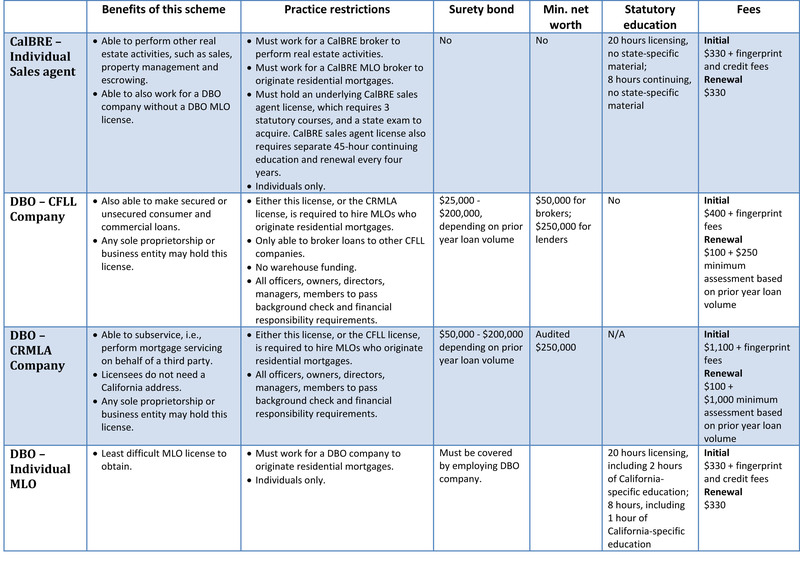 Read on for an explanation of the different MLO licensing schemes available in California, and the steps you take to obtain and maintain your MLO license or endorsement. In contrast to consumer mortgage activity, the making or arranging of business, investment and agri-business purpose mortgages secured by any type of real estate, or consumer loans secured by a mortgage on other than one-to-four unit residential property are controlled by different licensing rules under the California Bureau of Real Estate (CalBRE) and California Department of Business Oversight (DBO). MLOs may obtain authorization to originate residential mortgages under one, two or all three of these schemes. Why choose one scheme over the other? It depends on many factors, including the related activities you want to engage in and whether you are employed or self-employed. 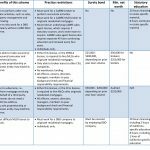 In addition to NMLS minimum MLO honesty requirements, the CalBRE and DBO each set their own requirements for MLO qualification. 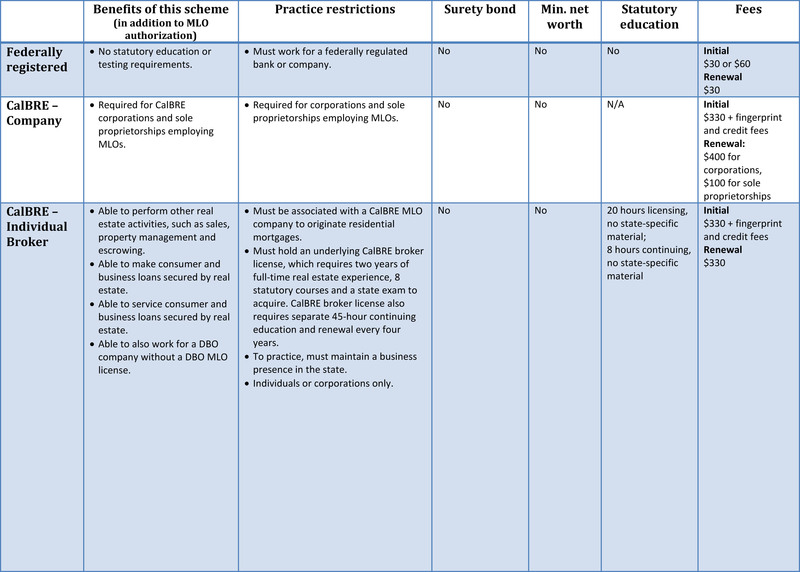 The tables below summarize some of the requirements for each type of license/endorsement. Click on the images to expand each page of the table, or download the PDF file here. 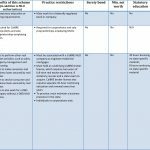 A more in-depth discussion of each license/endorsement type follows. If you originate residential mortgages as an employee of a federally regulated bank or credit union, such as Wells Fargo of Bank of America, you are required to register as a federally registered MLO. The first step is to get a job at a federally regulated banking institution working in a residential mortgage position. Fees are involved, and depending on how your new employer works, they may require you to pay the fees, or foot the bill themselves. The initial set-up fee for an MU4R filing is $30 if registration occurs between January and June, and $60 if registration occurs between July and December. Prior to the renewal, your employing bank will give you a request to renew reminder. This requires you to confirm and attest the information in your NMLS registration is current. The renewal fee for a federally registered MLO is $30. Editor’s note — The endorsement is only triggered by a mortgage modification if you’re paid for the negotiations specifically, rather than completing negotiations simply as the seller’s agent. state and federally chartered institutions. Commensurate with the wide range of activities a CalBRE licensee may perform come relatively rigorous licensing and MLO endorsement requirements. Once issued, the sales agent license is good for four years. The broker license is good for four years. Company and branch endorsements require the designation of a qualifying individual or branch manager who is a broker with an individual broker endorsement. Thus, the core endorsements are the individual endorsements. To obtain an individual MLO endorsement to your CalBRE license, you first register for an NMLS ID number. 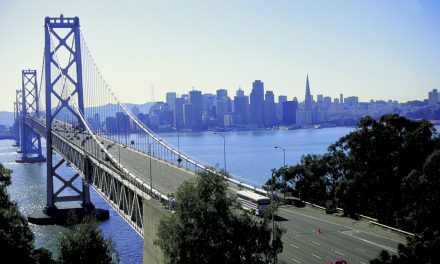 In addition to the minimum requirements to be met by all MLOs, CalBRE licensees may not have had an MLO license revoked in any governmental jurisdiction. CalBRE doesn’t enforce a minimum credit score. Likewise, negative financial events, such as bankruptcies are not cause for an automatic denial of an MLO endorsement. CalBRE MLO-endorsed licensees do not need to post a surety bond, or meet minimum net worth requirements. Only the individual endorsements require education, background checks and fingerprinting. The corporate broker endorsements require only application and renewal. CalBRE MLO endorsements are good through December 31st of each year if issued prior to November 1st. Endorsements issued on or after November 1st are valid through December 31st of the next year. To apply for an MLO endorsement as a CalBRE sales agent, you’ll complete NMLS Application Form MU4 online at the NMLS website. Fees for obtaining an individual sales agent CalBRE MLO endorsement include course fees payable to an approved course provider, a $300 CalBRE endorsement fee, a $30 NMLS processing fee, a $15 credit report fee and a $36.25 background check fee. Initially, as a CalBRE broker, you’ll need to register for an NMLS ID number. Then, your CalBRE MLO endorsement filing depends on how you structure your brokerage business. For endorsement purposes, you’ll either apply as a broker-associate employed by another broker, a sole proprietor or a corporation. Broker associates are employees of another broker and only need to obtain an individual broker endorsement using NMLS Application Form MU4 online. a $36.25 background check fee. a company CalBRE broker MLO endorsement using the NMLS Application Form MU1 online. an explanation of any criminal convictions. The fee for the sole proprietor application is $100, payable to the CalBRE through the NMLS website. a corporate CalBRE broker MLO endorsement using the NMLS Application Forms MU1 and MU2 online. a $15 credit check fee for each of the non-licensed officers and stockholders. All fees are payable through the NMLS website. Branch offices require you to designate a branch manager, have the branch manager explain any criminal convictions on their record and pay a $20 NMLS processing fee. Fees for renewing a CalBRE sales agent license on time are course fees paid to an approved course provider and a $245 renewal fee paid to the CalBRE. Fees for renewing a CalBRE broker license on time are course fees and a $300 renewal fee. paying fees to the CalBRE through the NMLS. $20 for each branch office endorsement. However, CFLL companies and their employees may make both secured and unsecured consumer and commercial loans. In contrast, the CRMLA was created to license mortgage bankers whose main business is making and servicing residential mortgages. The CRMLA license is the only license which allows you to service loans which you did not originate or purchase, i.e., service loans for third parties. The CRMLA MLO license allows you to broker mortgages, but only to other CRMLA lenders, and state and federally chartered institutions. All entities – corporations, limited liability companies (LLCs), partnerships, trusts and sole proprietorships — are eligible to obtain a CFLL or CRMLA MLO license. As with all MLOs, the first step is to obtain an NMLS ID. the Federal Home Loan Mortgage Corporation (Freddie Mac). $20 for a CRMLA branch. Additionally, a CFLL branch requires fingerprinting of the branch manager, and a written agreement between the branch manager and the CFLL company. Note that a CRMLA branch license is required for an out-of-state office location if it conducts residential mortgage business in California under the CRMLA. $1,100 for a CRMLA company MLO license paid through the NMLS, plus $20 per controlling member for Livescan fingerprint processing paid through the DBO. Both company and individual DBO MLO licenses are good through December 31st of each year if issued prior to November 1st. Endorsements issued on or after November 1st are valid through December 31st of the next year. The DBO MLO licenses renew every calendar year between November 1st and December 31st. Renewal consists of confirming the information on the NMLS registry is still current and correct. $1,000 for a CRMLA license. All fees are paid through the NMLS. 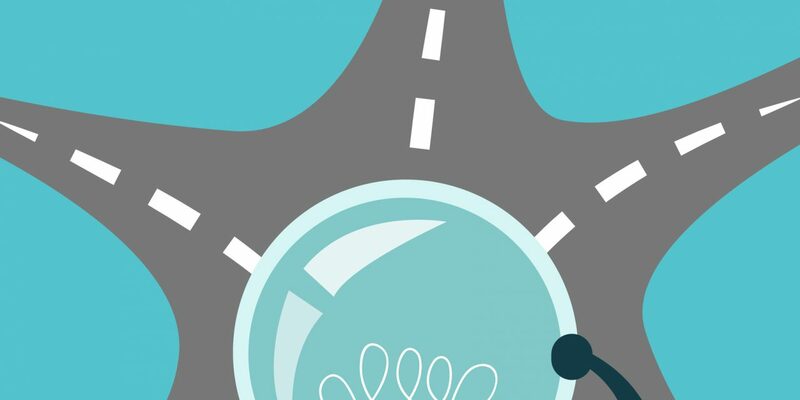 Next in this article series: Transitioning from one MLO licensing scheme to another — coming soon! 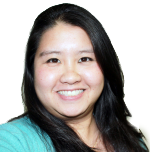 Thank you Giang Hoang-Burdette for helping to clarify (to some extent) the requirements for a broker to obtain the NMLS endorsement to broker loans. It’s something I have asked First Tuesday about. At one point in time I was an appraiser. Then…the gov’ment decided to form another “bureau” as a middle man between the appraiser and the bank. Then they also required “licensing.” I had already taken a lot of appraisal courses, but again, I bought the required courses, studied some more, took the test and got my “Trainee’s license.” Then the state required that you have a “sponsor” who would review your work and be responsible for what you did. I searched in vain for someone who would sponsor me, with no luck. All my time effort and money spent was for nothing. Most licensed appraisers did not want: 1. Anyone else coming into the business and taking their work 2. Did not want to be responsible for someone else’s work. (I offered to PAY the sponsor). I am still upset to this day. Now we are looking at the same kind of bureaucracy regarding brokering loans. We must spend more money for study, testing, etc., as if this is going to protect consumers by making dishonest loan brokers more honest. Just sayin’. Thanks again for clarification. First Tuesday is a valuable asset.